Kenny Weissberg has followed the music his entire career. He produced/hosted 2,500 radio shows for eight different stations from 1971 to 2007, cofounded Boulder’s progressive public station KGNU in 1978, and created and hosted the award-winning Music Without Boundaries in San Diego for 14 years. As a music critic, Kenny wrote close to 1,000 newspaper and magazine articles for 17 publications, including the Denver Post, Boulder Daily Camera, Creem, Rocky Mountain Magazine, and Cake Eaters. 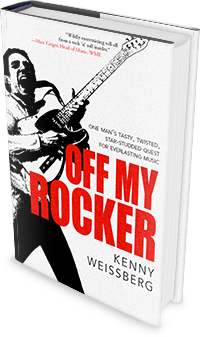 He fronted his own rock band, Kenny & the Kritix, from 1980 to 1983 and was the subject of two mini-documentaries about music critics taking center stage as a performer. Following his stint as a rock singer/bandleader, he produced the internationally acclaimed Humphrey’s Concerts by the Bay series in San Diego for 23 years, presenting nearly 2,000 concerts.